I’m up for the challenge. Are you? Starting in September we are going to have special musical Shabbat services every month. These services will have instruments, including our Ruach band, and other professional musicians. We will have guest song leaders, and encourage people to sing and clap maybe even to dance in the aisles. We want to change the entire feel of the service from start to finish. There may be melodies you don’t know. We will ask you to be out of your comfort zone in singing or clapping along, and I’m going to ask you to try it. 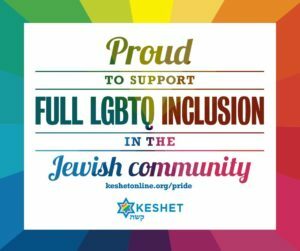 When we all do it together the feel can be amazing: it will lift you up and let you feel that services have connected you to this community and God and the Jewish people, and it can make you want to feel that way again. But if everyone is shy or showing discomfort it will lead others feel uncomfortable as well, and we may all walk away feeling this was a bad idea. Change is hard, and asking a cantor to change the traditions of a synagogue is asking for trouble, so I’m asking you all to give it a try. Make music with me, connect with God with me! Changing the music of one service a month is our attempt to revitalize worship in this community, and it cannot be done without your help. We need your presence to try it, we need your participation within it, and we need your help to make it the best possible. Friday September 9th will feature guest singer/songwriter Eric Komar, author of “Justice Justice.” He will not only be sharing some of his music and helping to lead services and our band on September 9th, but he will be working with me and teaching me and our volunteer band over the summer so we can be more professional, have a greater repertoire, and work better together. Improving our quality, and bringing in guests happens only with financial help. And we will be looking for sponsors for our special musical services. If you like these services consider sponsoring the next one. If you are made uncomfortable, consider trying it again (as new things take time) but PLEASE share with me your thoughts, tell me or a member of the worship committee or Board of Governors what you didn’t like, what made you uncomfortable, what you were looking for instead. This is a great experiment and change is hard. Come and experiment with us. We may lift you up in a way you never knew possible!